The Coe At West Village (Facebook photo). It's always good to see new developments in neighborhoods beyond downtown, Midtown and Corktown. 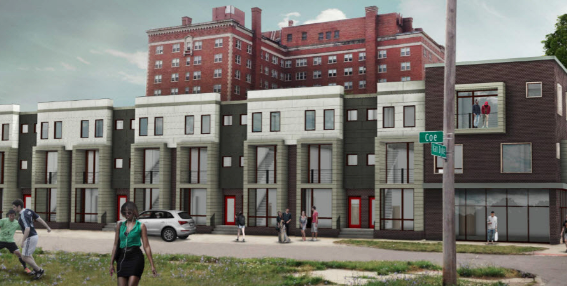 Construction crews will break ground next month on The Coe at West Village, the first new development financed by a $30 million fund designed to drive “inclusive economic growth” in the city’s neighborhoods. The 12-unit complex will add eight townhouses, four apartments and about 1,200-square-feet of retail space to the corner of Van Dyke and Coe in the West Village neighborhood. Three of those units will be designated as affordable housing. The building will be constructed on a vacant lot around the block from a recently redeveloped strip of restaurants and stores in the growing east-side neighborhood, which joins an area of southwest Detroit and the Livernois-McNichols area on a list of three neighborhoods the city and private nonprofits have targeted for investment through the Strategic Neighborhood Fund.